Japanese pianist/composer Takana Miyamoto may not be a household name, but she's already had a successful international career that spans 19 years. Born and raised in Japan, she graduated from Berklee School of Music and joined Nnenna Freelon's band and toured the world. She is also credited as the musical director for Freelon's Grammy-nominated album Soulcall. 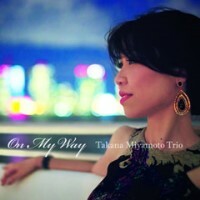 For her Japanese debut CD, Miyamoto chose two great New York-based musicians. Bassist Matt Penman was her classmate at Berklee, and Ulysses Owens Jr is a tremendously talented young drummer and already a Grammy winner. With this splended rhythm section, Miyamoto showcases her own compositions and pays tribute to great pianist/composers who influenced her by playing their compositions: Dave Grusin ("Night Walk"), Esbjorn Svensson ("Elevation Of Love"), Burt Bacharach ("A House Is Not A Home"), Bill Evans ("Peri's Scope"), Bud Powell ("Parisian Throughfare") and Oscar Peterson ("Wheatland"). The unifying theme of the album is "journey". The program begins with "On My Way&,quot; an original tune composed while Miyamoto was pregnant with her first child, and ends with a poignant Japanese song "Road Of Memory" signifying her homecoming. With varied materials, effective arrangements and energetic performance, this is a very nice piano trio album! Recommended! Recorded at Tedesco Studios, Paramus, New Jersey on September 10 and 11, 2012.